These hybrids grow so many spectacular varieties, it’s hard to pick your flowers. AS LONG AS there have been peonies, breeders have been frustrated because no one could figure out a way to cross a tree peony with an herbaceous one. Then, in 1948, after thousands of attempts, Toichi Itoh, a Japanese nurseryman, finally achieved the first successful cross. Unfortunately, Itoh died before his hybrid flowered. 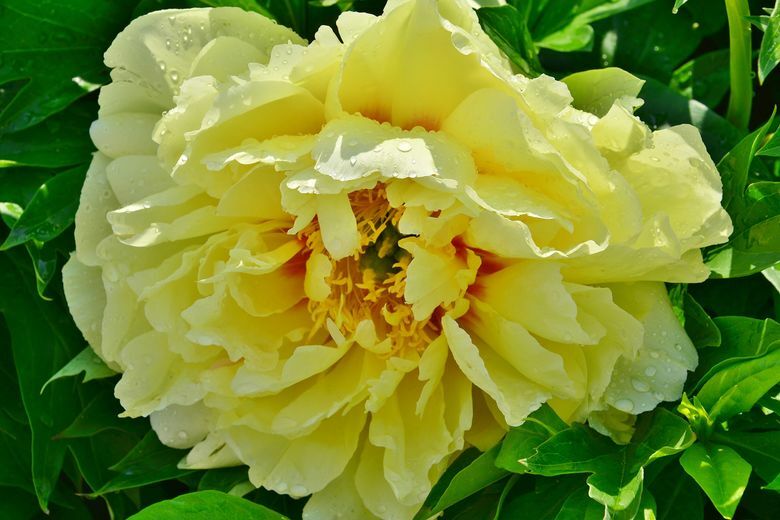 His secret methods might have been lost forever, but his family shared them with an American breeder, and over the years, several of what are now referred to as “Itoh peonies” have been created. Itoh hybrids, however, were extremely difficult to propagate, and until about 10 years ago, you could expect to pay more than $1,000 for one of these rare beauties. Now, though, thanks to new propagation techniques, Itoh hybrid peonies are much more available and affordable; plus, exciting new varieties are showing up every year at local nurseries. 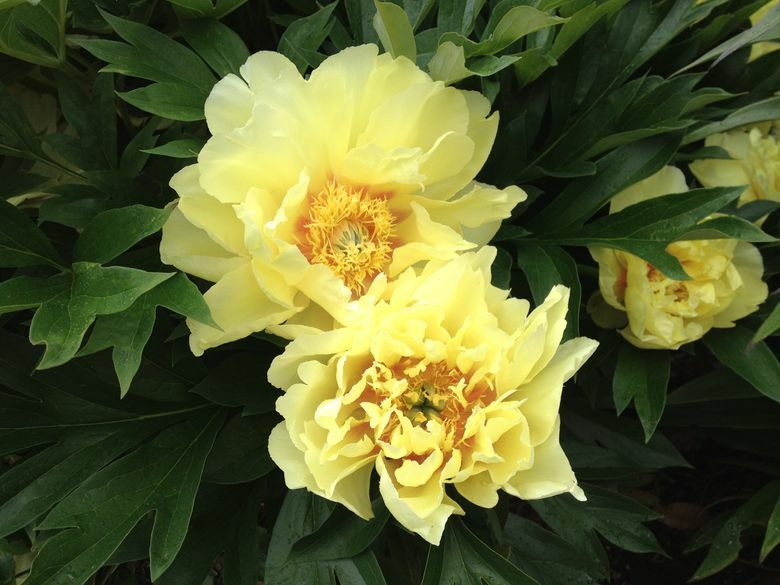 Itoh peonies feature the best traits of both parents. They resemble herbaceous peonies, forming a 3-foot-tall and -wide dome of lacy, dark-green, disease-resistant foliage that looks attractive all season, and turns fiery orange and red in fall. It’s the incredible tree-peony-like, spicily scented, dinner-plate-sized flowers, however, that make Itoh peonies absolutely irresistible. The spectacular blossoms not only occur in late spring after most peony flowers have faded, but they’re also produced on strong stems that don’t require staking. Another exciting trait is that a mature Itoh peony generally bears 30 to 50 flowers that open in sequence. When one bloom fades, another takes its place, creating a long-lasting blossoming display that can last for more than three weeks. I paid $99 for my first Itoh peony ‘Bartzella’ about seven years ago. It boasts huge bright-yellow double flowers, stained red in the center, making it a dramatic showpiece in my spring garden. More recently, I paid about half as much for an astoundingly beautiful ‘Kopper Kettle’. The fragrant, semidouble, 8-inch-blooms open copper-rose, then turn gold with a burgundy-blotched center as they age. This spring, I’m thinking about picking up a ‘Julia Rose’, with flowers that begin deep pink, change to peach and finally turn pale yellow. I’m also eyeing ‘Scarlet Heaven’, featuring huge, dark-red, single flowers centered with golden-yellow stamens. But then there’s ‘Keiko’, with its dark lavender-pink petals maturing to soft pink, or ‘Singing in the Rain’, with creamy yellow, semidouble blooms that become flushed with salmon coloring. But, I also must have ‘Misaka’, with orange flowers that fade to a beautiful peachy yellow. And how can I resist the large, fragrant, single-to-semidouble, fuchsia-pink blooms of ‘Morning Lilac’? And then there’s ‘Takara’ and ‘Yumi’ and … something tells me I’d better hope the price of Itoh peonies keeps coming down! 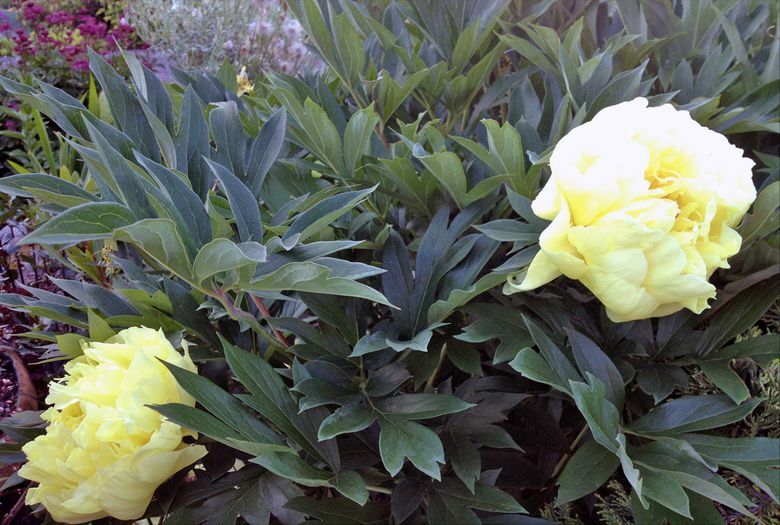 Plant Itoh peonies in a sunny, open location in well-drained soil amended with compost. Although they are quite drought-tolerant once established, water well the first season to establish a strong, healthy root system. Avoid wetting the leaves when watering, to prevent Botrytis, a fungus disease that can mar the appearance of the leaves. Cut the stems down to the ground in autumn, as you would herbaceous peonies. Because the flowers open over an extended period, Itoh peonies look best if you deadhead by removing the spent blossoms, using care to avoid injuring emerging flower buds in the process. Finally, those big Itoh peony blooms make wonderful cut flowers, but spray them off with the hose before bringing them into the house, especially if you plan to use them in a centerpiece at a dinner party. Ants that are attracted to a sweet substance on the buds often hide in the flowers, and nothing will embarrass the living tweedle out of you more than if your dinner guests discover uninvited guests hiding among their Brussels sprouts casserole.